On Saturday, I ran a half marathon. Yes, it was a total last minute decision. Katie was selling her race bib because she is just starting her running comeback after an injury; I hemmed and hawed most of the week about buying it from her. On Friday after work, I sent her a message asking if the bib was still available. Since it was still up for grabs, I was running a half marathon the next day! One odd advantage of training for a marathon--the ability to do a half marathon spontaneously! 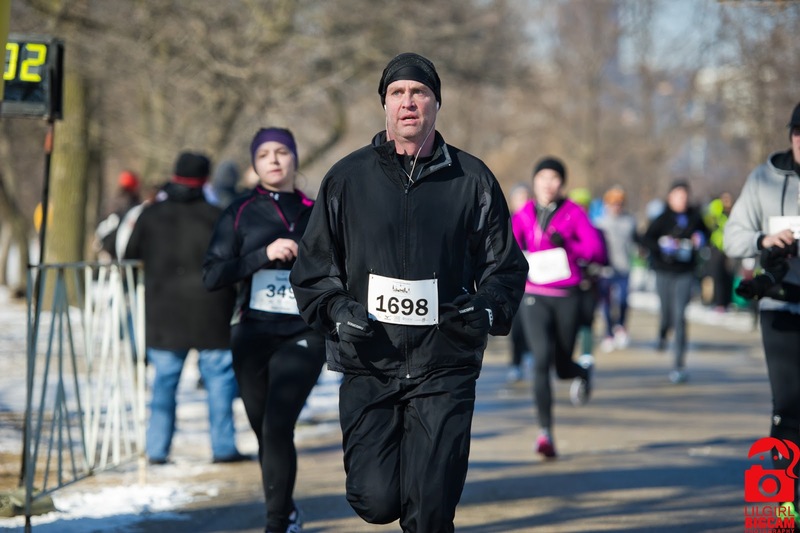 The F^3 Half Marathon was along Chicago's lakefront starting at Montrose Harbor. I'm not a huge fan of doing races in the city because it usually means a very early wake-up, a hectic drive into the city, and a $20+ parking fee. With a race that started at 10 am and had plenty of free street parking, all my reasons for disliking city races were averted. I was able to sleep in till about 7:30 am and eat my two pieces of peanut butter toast in my apartment instead of stuffing them in my face while I simultaneously drive my car and attempt to program the race address into my GPS. I realize how stupid doing all of that at the same time is, but it's happened before. I got to the race plenty early and ran about a mile to warm-up before standing in the long port-o-potty line. That is probably my one and only complaint about this race--a 10-15 minute wait for the bathroom. I still managed to make it to the start line just before the national anthem and then the official start. 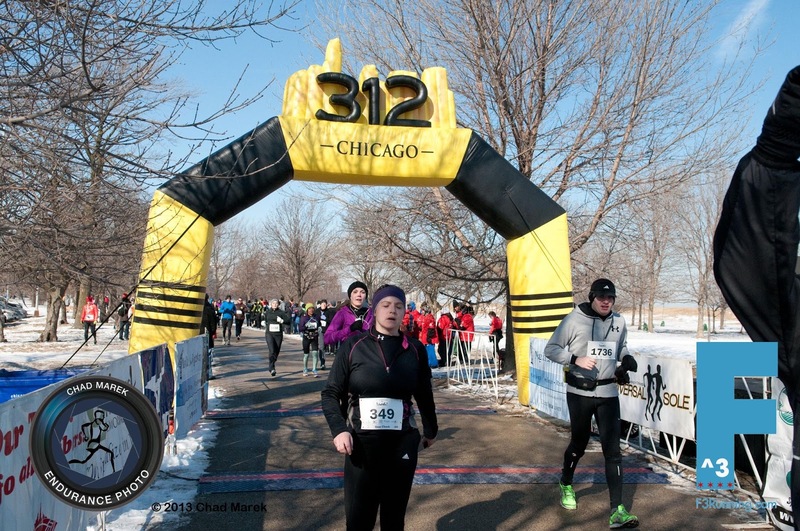 The cold is sometimes a downside to winter races, but Saturday wasn't too cold and I was warm in my new pair of fleece-lined Adidas running tights, an Under Armour Coldgear mock turtleneck, and a running jacket thing. Gloves and a headband are a must for winter running as well! My plan for this race was to use it as a training run and so I started off at a nice and easy pace. I didn't even wear a watch so I have no idea what kind of pace I was running. Since I got to the start line so late I started pretty far back in the pack and spent the majority of the first 3 miles weaving through people. Around mile 4, I saw some familiar faces-Lindsay, Kelsey, Sierra, Katie, and Emily. Thanks for coming out and cheering ladies! And I also need to thank Molly-Katie's fur nephew for cheering us on as well. I give major props to these women because I think standing around in 20 degree weather sounds much worse than running in 20 degree weather. At the turnaround at mile 8, I picked up my pace a bit. I was still feeling good and still clueless as far as my pace and how long I'd been running. The aid stations were awesome and a bonus with the cold weather-the drinks were always cold! It was quite a surprise to learn I finished my third half marathon in 2:00:10-a new PR! Definitely unexpected since this was supposed to be "just" a training run! Proof that my speed training is working? Bonus: Free race pictures! Thanks photographers! I didn't hang around long after the race or go to the after party, but I did manage to meet some other running bloggers - Maggie and Kelly. Overall this was a great race and I will consider doing it next year!